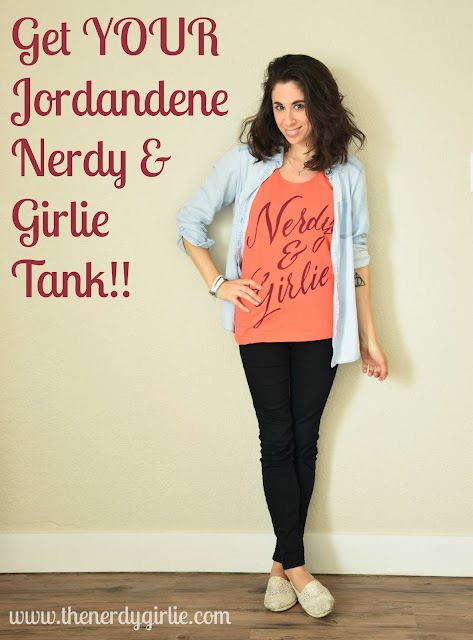 Megan Elvrum: Jordandene & The Nerdy Girlie Team Up! Jordandene & The Nerdy Girlie Team Up! Jordan has been one of my favorite nerdy designers for years now. I remember the first time I wrote about her on the blog and the day she sent me my very first tank! It was love at first sight and we've been online friends ever since! It was one night here in my new Denver home, that an idea popped into my head. Usually when I'm trying to fall asleep, that happens. I grabbed my phone and sent Jordan a quick email about joining forces! It was only a couple weeks later I received our brain child! I've put together a few outfits for you, to show the versatility of Jordandene's amazing tanks! The first is my go to outfit. I wear this pretty much everyday. Ocean Eyes can attest to that! What I've learned about Denver weather is that layering is a must! So tank + my favorite comfy chambray top + a hoodie and a scarf on top is my uniform of choice. I live in these black pants, so much so that I need to go get another pair so I can wear them everyday! Spring is suppose to be here...most of the time it is...this weekend it was for sure! So I had to pull out my favorite hippy inspired look! These Born wedges are my go to, to make any outfit a bit more dressed up! I love a long skirt, it makes me feel dressed up. Pop on a lil lace cover up to complete the look. Bring on Spring! Even more exciting news! I've just booked Ocean Eyes and I's very first vacation! I'm taking him home to LA and allllllllll of my favorite places! First stop after In-n-Out for him? Republic of Pie! We are going to Hogwarts and to see one of my new favorite bands Walking On Cars! So excited! You can bet this will be my beach day outfit! Bring on the sand and sun! Can you tell that I love to be cozy?! This sweater is one of my go too pieces. It is super soft, easy to layer and WARM! I love adding a bit more color to the look and this scarf has just the right amount of orange in to compliment the tank! You can't go wrong with a nice pair of jeans and boots either! I hope you all like the tank! It will also be coming in a second color: a pretty light blue with a navy text. You can find both on Jordandene's website NOW!!!! Awesome shirt! Congrats on the collab. I love Jordan's stuff. This is so great, and you two partnering is such a no-brainer! I'm excited for you, and can't wait for the shirt to officially release! I still remember the first day I discovered Joedandene, it was on one of your Instagram posts! And I now have that shirt and one other. I will soon have this one, too. I actually messaged her already to ask when it would be available. Oh wow this is so awesome! So adorable! What a perfect team up! So cute! Your posts are one of the first places I ever saw her shirts, and now I own three! This is a perfect match up, and I love the shirt!